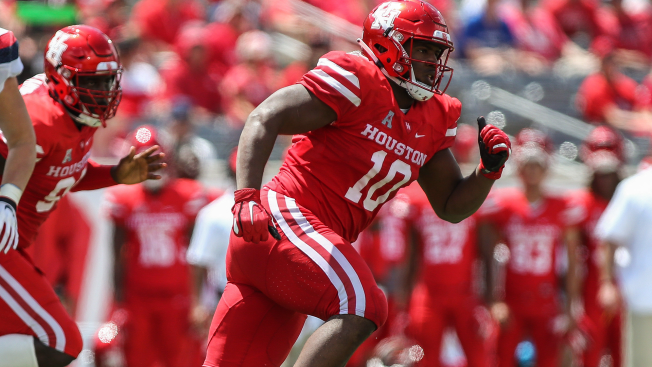 There's no question that Ed Oliver has first-round talent, but there is a question about where in the first round he'll go. Let's be honest, though. If the Eagles want Oliver, it's going to take a modest to significant trade up. But he might just be worth it. At 6-2, 287 pounds, Oliver doesn't have prototypical size for an NFL defensive tackles, but he can flat out play. The comparisons to Aaron Donald aren't perfect, but they're unavoidable. And they make sense. Oliver might need to put on some more weight to last in the NFL, but you just can't overlook his athleticism and ability to get after the passer from an interior defensive line spot. Interior line pressure has become more vital in the NFL in recent years and Oliver projects to be a great pass-rusher. There was that silly jacket incident at Houston and teams probably wanted to sit down and talk with Oliver to get to know him as a person. The tape speaks to what kind of player he is. He had good production at Houston and eye-popping ability. For a while, it looked like Oliver was set to take a tumble in the first round, but now that's harder to imagine. If Oliver starts to make it past 10 and into the mid teens, the Eagles need to make a call to see how much it would take. How he would fit: Oliver would come in and play a lot as a rookie as a rotational piece to complement Cox and Jackson, but would become a starter before long with a huge upside and Pro Bowl potential.